Amazon India selling Bigen Men's Speedy Color, Natural Black 101 (40g 40g) Rs. 275 only which is worth for Rs 425 . You can follow the below steps to buy this product at their deal price.Keep Visiting dealsheaven.in for more Best offers ,hot online deals, promo code, free Samples ,deals online,coupons and discount . You can use only the necessary amount of cream to cover partially grey hair or short hair. Keep the remainder for future application. 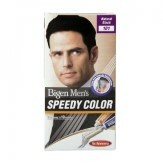 How to buy Bigen Men's Speedy Color, Natural Black 101 (40g 40g)?